Experience paradise as the “locals” do, and join us for a digital tour of the best party spots in the Virgin Islands. From “No Shoes, No Shirt, No Problem” to body shots, there is a little something for everyone on this list. In most cases, if you forget to pack a lunch when you spend the day out on the water you are out of luck when your stomach starts growling. The same can’t be said for the people aboard boats in Christmas Cove. Currently ranked the #1 restaurant in St. Thomas, Pizza Pi opened for business in November of 2014. Named using the greek symbol Π, Pizza Pi takes on two different meanings with the play on words “pie” meaning pizza and the greek letter pi, which is said by the owner Sasha to be “a really special number” that has infinite possibilities. 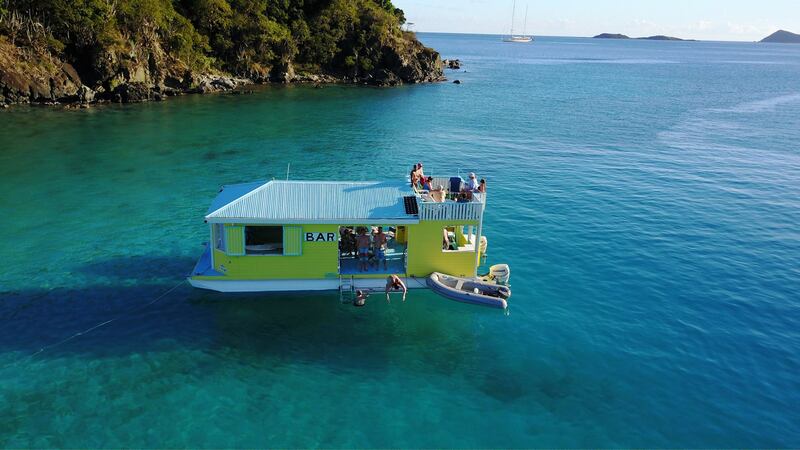 This floating pizzeria can only be accessed by boat, and is anchored off the east end of St. Thomas in Christmas Cove next to Great St. James Island. You can either order through your boat’s radio, call it in, or even email it! If you are anchored in Christmas Cove, Pi will even deliver the pizza to you in their dinghy. Watch out for specials and promotions around national holidays, such as April 7 – National Beer Day, where Pizza Pi is giving away two free beers with each order! Featured Drink: honestly, pizza is all we really need but you might also want to try the ice cream float + rum. A 40-foot pontoon boat that is normally anchored just off the beaches of St John’s East End during the day and in Coral Bay at night – Angel’s Rest consists of drinks that are more rum than mixer and the business cards are made out of clothes pins with scribbled sharpie numbers. This modern day twist on a “Cheers” style bar is full of personality! Angel’s Rest is only accessible by doggie paddle or smaller boats such as a dinghy or kayak, but typically will be anchored about 100 feet from the shore so don’t worry about doing any Olympic training before your visit. If you want to make sure Angel’s Rest will be pouring drinks while you are nearby you can always call captain Peter Hoschl himself at 340-514-6270, or check their Facebook page for updates and location changes. Captain Peter can also provide water wings for those light weights that have had one too many. Featured Drink: Rum and Punch, which really ends up being more rum than punch! Don’t ask Captain Peter for his secret ingredient, he won’t give it up! This floating bar and restaurant is one of the only places in the USVI that you might see a ski lying around, and it’s not for going down a snowy slope. At Willy T’s it’s not uncommon to see patrons “walk the plank” (although there is signage stating it is prohibited) and taking shots with their friends on the shot ski. Don’t even get us started on the body shots. 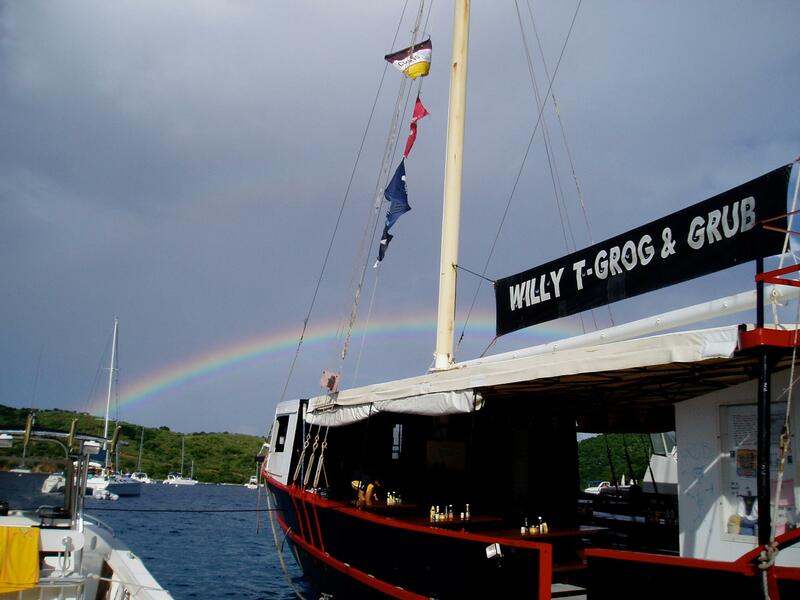 Willy T’s is on Norman Island, BVI so a passport is required if you’re visiting from the USVI. Plan a day trip (that can turn into a night trip) to Willy T’s combined with snorkeling at some of the famous spots nearby (the Caves and the Aquarium to name a few). This stop on the party tour is definitely rated arrrrggghh (R), so make sure to leave the kids at home. Be careful, you might leave with a Willy T’s (temporary) tattoo! Featured Drink: Famous for their body shots and four person shot ski. 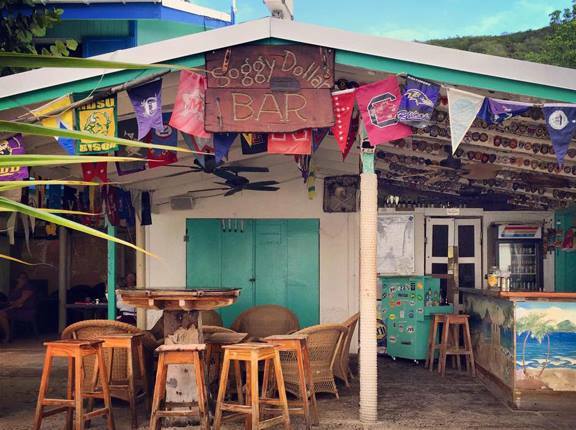 Located in White Bay, Jost Van Dyke, the Soggy Dollar is one of our favorite spots to go party like “the locals”. White Bay can be found on the western side of Jost Van Dyke, which is only about 8 square miles in area, so it shouldn’t be hard to find! White Bay only has about 222 residents, and on any given day the Soggy Dollar will serve well over that number in cocktails. There’s no way to dock at this beach, so be prepared to take a leap of faith off your vessel to join the fun ashore, do you get where the name came from yet? (We will give you a hint, it has something to do with patrons jumping in the water with their wallets in their pockets). Unlike some of the other spots on this list, the Soggy Dollar is totally family friendly with a little something for everyone! Swim in, open a tab, and start a conversation with Mickey who is normally tending the bar. Featured Drink: The original painkiller cocktail – that’s right, this rum-based cocktail that every other beach bar in the Virgin Islands is trying to imitate was made first at the Soggy Dollar. 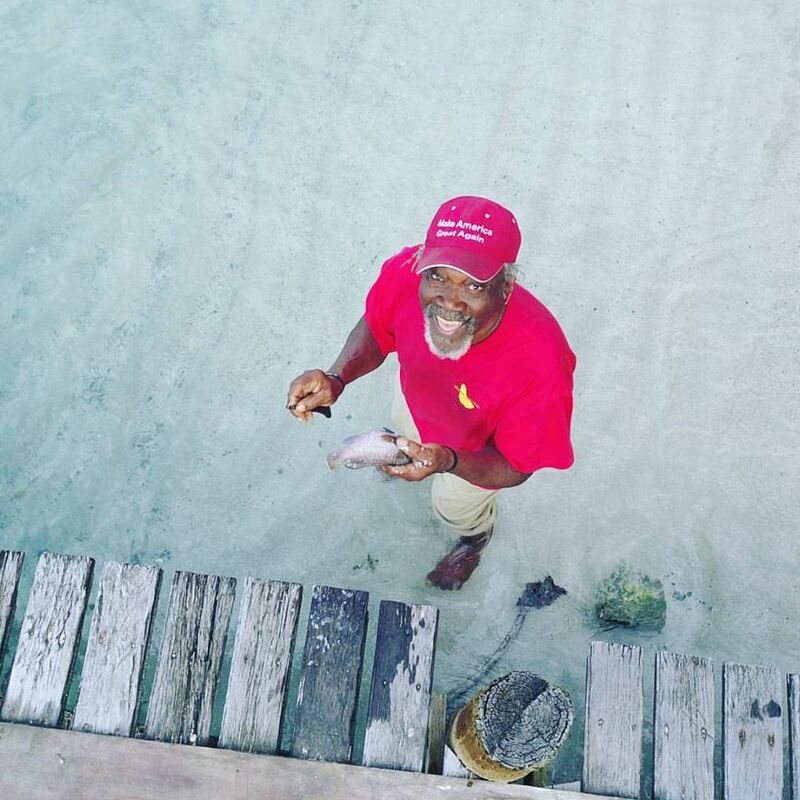 The locals would agree, the BVI and Jost Van Dyke would not be the same without Foxy Callwood and his gift of mixing drinks and charming guests. Stop by on the right night and the man himself might be there strumming his guitar. If you tell him about your travels, he is known for singing some lucky patrons their very own tune made up on the spot. If you happen to visit around a major holiday, chances are Foxy’s will be hosting the best themed party on the islands. The locals claim that Foxy’s is the third most requested New Year’s Eve location aside from Trafalgar Square in London and Times Square in New York. If you decide you want to bring a taste of paradise home with you, Foxy’s Firewater Rum is bottled and available for purchase in the gift shop. Find Foxy and the gang at Great Harbour, British Virgin Islands. Featured Drink: The Dread Fox – this cocktail is mixed with house made Foxy’s own Firewater Rum! No drama allowed here, ask Kenny Chesney, this is where his music video “No Shoes, No Shirt, No Problem” was filmed! Ivan Chinnery is a medicine man, herbalist, and according to the residents of White Bay, an all around good guy. Just down the way from the Soggy Dollar, Ivan’s is a great place to escape the party scene and relax. The one thing that sets this beach bar apart from the rest is its namesake himself, Ivan. Genuinely interested in the lives of his patron’s, this native islander will make you feel like you are talking with an old friend. If you have one too many while enjoying a stress-free day at Ivan’s you can keep the relaxation rolling by taking advantage of his campground. Featured Drink: Try a Stress-Free Punch to help achieve maximum relaxation! From stress-free to walking the plank, you won’t be disappointed with any of these party spot “bests”! As always, have a good time and drink responsibly.